Check Out My Newest Book! With sweet and simple rhymes, these poems celebrate a range of sports. From baseball and basketball, to karate and swimming, there’s something for everyone! Baseball, basketball, karate, gymnastics, lacrosse, cycling, hockey, soccer, figure skating, tennis, football, and swimming–sports are so much fun to play together. 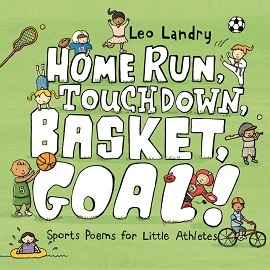 Young and adorable art adds extra appeal to this poetry collection for the very youngest of athletes. © Leo Landry. All rights reserved. Website by We Love Children's Books.